- Cheongnyang Mt. : A short city bus trip outside of Andong, this is a great hike that has a beautiful sky bridge at the summit. If you want great views, come to Andong and check it out. Also half way up the mountain there is an awesome tea shop near the temple that is a great place to rest after this hike. - Korea's southern islands, including Yonghwa Island: Going south and exploring the interesting islands near Tongyeong city is a new and different view of Korea. You can island hop to a variety of different little spot and see some great things. We even camped on one of the islands which isn't done often (as far as we could tell) but we had fun just the same. Check it out, it's gorgeous! Andong Dam: even though it can feel a little small sometime, Andong is a really great city that is surrounded by many beautiful places, including Andong Dam. It's a place Danny and I love to run by, especially the Twilight Bridge which is beautiful to see lit up at night. Gyeongju ~ Bomun Lake: Going to Gyeongju is a always fun, but Bomun Lake is definitely a highlight. 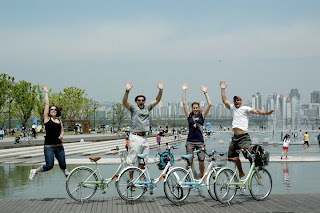 We discovered that you can ride around the lake on these awesome mini motorcycles, ride bikes and much more so Gyeongju easily became a favorite place in Korea. Check it out in the spring when the cherry blossoms are in bloom, it is especially beautiful. - Yoido Island: this place is not really an island but it is an awesome an fun place to enjoy the outdoors in Seoul. This is the biggest park area that we've found in Korea, full of families playing in the fountains, lying in the sun and riding bikes. Renting bikes is extremely cheap at 5,000 won for 2 hours and it makes you feel like you are on vacation in the middle of a huge city. This was one of my favorite places in Korea to enjoy the outdoors in. Hiking near Busan... we could see the ocean from the top! Seobeksan: amazing in the fall.